When will quantum communications blast off? 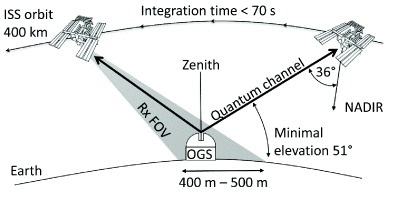 I think it’s safe to say that quantum communications between satellites and ground-based stations should be possible. Optical signals have already been sent 144 km through the air between ground stations at sea level. More recently, quantum communications have been achieved between an aircraft in flight and a ground station 20 km distant. While quantum communications have been sent comparable distances via optical fibre, it’s unlikely that the fragile single photons used in such missives would survive an ocean crossing unscathed. Therefore if technologies such as quantum key distribution cryptography are to become truly practical, satellites must be involved. The next logical step is therefore to send quantum-communications kit into space – and the cheapest way of doing this is to tag along on the International Space Station (ISS), which orbits at about 400 km above the surface of the Earth. While this is much further than 144 km, for most of this distance the atmosphere is very thin and therefore much less likely to interfere with quantum communications than air at sea level.Leading researchers have already made several proposals to get experiments on board the ISS, but these have been turned down. Now Rupert Ursin and colleagues at the Austrian Academy of Sciences and the European Space Agency (ESA) have put together a new proposal with a twist. 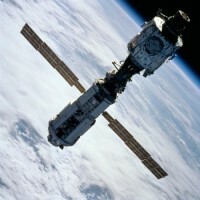 Unlike previous plans that involved sending quantum signals from space to ground, the team want to fire them up into space.An important benefit of this approach, they argue, is that only a small amount of equipment must be sent up to the ISS – single-photon detectors that have already been qualified for use in space. This is unlike a quantum transmitter, which would require the qualification and launch of lasers, crystals and other equipment. Previous proposals have focused on space-to-ground transmissions because of something called the shower-curtain effect, which ESA says "can indeed be observed by looking through a transparent shower curtain while taking a shower. The view from the inside out (from behind the shower curtain) is very much blurred, while the view from the outside in (from some metres away from the shower curtain) is comparatively clear". The upshot of this is that a downward signal encounters much less disruption than an identical upward signal – and this is very important because the single photons that carry quantum information cannot survive much jostling en route. But now Ursin and colleagues argue that the latest entangled photon sources are so good that a ground-to-space system could tolerate the much higher losses that result from the shower-curtain effect. Indeed, physicists would have to demonstrate the feasibility of an uplink anyway, so why not cut to the chase? Their proposal has just been published in the New Journal of Physics and you can read the paper here. Will it be approved? Maybe or maybe not, but I’m certain that eventually we will see quantum communication with satellites.